Spring-time is one of my favorite times of the year and these Easter Egg Bird Nests are a fun and festive way to celebrate the season. I tend to bake a lot around the holidays, it’s just what I do. Technically this treat isn’t baked, but they are super cute, so I just had to make them. Crunchy, sweet nests of Chinese Noodles coated in chocolate and peanut butter with a delicious peanut butter egg nestled inside. I came across them on the Tasty Kitchen section of The Pioneer Woman’s website and decided to make them for my family for Easter. I love a good recipe that doesn’t involve a long list of ingredients. Happy Easter, I hope you’ll enjoy them! In a microwave safe bowl, melt chocolate chips and white almond bark. Microwave for a 30 seconds at a time, stirring after each 30 seconds. Repeat the process until the chocolate is melted and smooth. Then add the peanut butter and mix well. Next add the chow mein noodles and stir until all noodles are well coated. Tear off 2 feet of waxed paper. 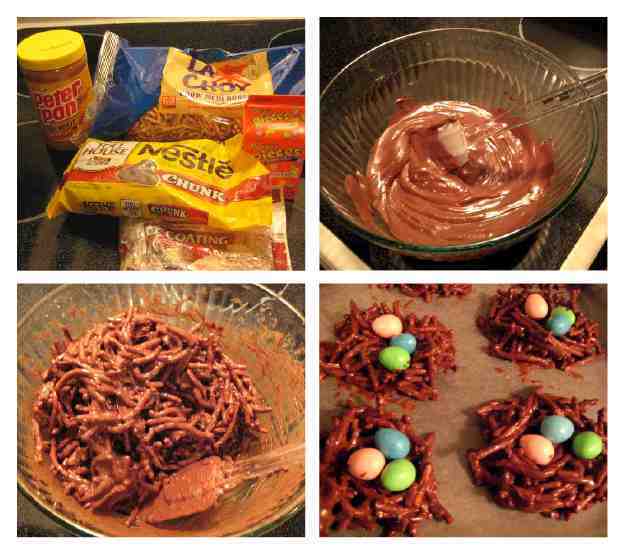 Using a ¼ cup measure, scoop out some of the chocolate noodle mixture. Drop mixture onto the waxed paper. Using a spoon to finish shaping the nests. The nests should be about 3-4” in diameter. Use the back side of a spoon or scoop to make the “bowl” of each nest. Drop 3-4 candy eggs into each “bowl” of the nest. When the nests have hardened, remove them from the waxed paper and transfer to a serving dish. These were so cute the kids loved them and it didn’t hurt that they tasted good too, everyone was fighting over the robins eggs and the nest too.